Going out for a run hopping on a groomed cross-country trail can be a quick easy stress-relieving way to get aerobic exercise and fresh air. Various length trail combinations keep your local cross-country area interesting and specialised design features promote successful outings. 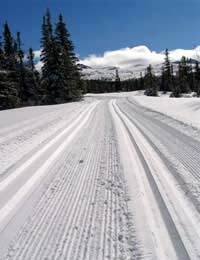 Cross-country trails are only limited by the groomer’s imagination and terrain constraints. However safety requires certain considerations when designing a trail. Experienced designers know 5-8 ft wide (depending on traffic levels) loop trails with one-way access minimize human to human crashes, as opposed to two way linear trails. When two-way traffic is necessary, separate uphill and downhill segments, 8 percent grade or greater, allow enough room for skiers to climb and descend without colliding. Adding connector trails and cutoffs maximizes loop options for skiers, and create safe turn around points for exhausted skiers. To keep trails interesting, designers prefer multiple short loops with several connector trails, rather than one long circle. Gradual curves allow gliding, fostering feelings of success. Sharp corners require more technical ability, and can cause traffic jams if skiers snowplow or fall. While trail design experts recommend avoiding curves on downhill slopes or at the base, they do happen. Signs should be posted to warn skiers, but be aware that there could be a tangle of beginners’ bodies and skis in the turn if the trails are busy. Usually at such curves the trail width and turning radius increase making more room for advanced skiers to clear the pileup. As you climb your way up a 10 to 12 ft wide groomed Everest base camp trail, remember uphill segments enhance your experience…and that they get easier as you become more in shape. Researchers have discovered novice skiers struggle on slopes steeper than 10 percent, while advanced skiers can handle short slopes up to 40 percent. Grade is measure of slope steepness equal to the vertical distance divided by the horizontal distance times 100. Grades of 0 to 2 percent are considered nearly level, like walking down easy street, while 13 to 18 percent is moderately steep, think capital steps; 26 percent and greater is very steep, not quite Mt Everest, but a good challenge on cross-country skis. Designers use switchbacks, flat resting areas and mild grade dips to break up longer climbs, while rewarding skiers with long straight downhill slopes followed by equally long and flat, if not slightly rising, run-outs. In addition to safety and traffic considerations, creating trails with great views and a feeling of exploration and wilderness is important. Trails that take skiers further from civilization, while providing benches, shelters and informational postings for safety, create an exploratory experience and the perception of being alone that many skiers enjoy. Some trail designers, like the groomers at Jackson Hole Mountain Resort in Wyoming, USA, take trail planning a bit further, considering the birds-eye view of the trail. Shaped like the company’s logo, a bucking bronco, the trail offers miles of scenery, sloping terrain and stimulating curves. Well thought out cross-country resorts trails start at a central point near the parking area and some form of lodge with at least warm beverages and rental equipment. Restricting the area for cross-country and snowshoeing use only and prohibiting snowmobiling provides safe quiet environment for a pleasurable outdoor experience. Wilderness views surround kilometers of groomed paths speckled with resting places to enjoy your surroundings. Keeping the skier’s experience in mind, trail designers utilise terrain variations to create interesting loops of assorted lengths that take skiers into their own mental spaces undisturbed by civilizations noise.